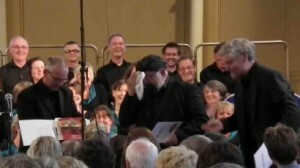 For some, opera is an acquired taste, but after the concert in St. John’s Church as part of the Ashbourne Festival, many discovered that, actually, it’s pretty good! 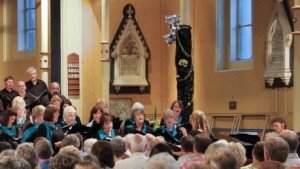 Linda Perry Smith led the Ashbourne Singers in a varied tour of opera choruses, many well known and popular, accompanied by Steve Duckworth on piano. Verdi’s Brinidisi opened the evening, followed by his Anvil Chorus, when a real anvil was brought into service for the accompaniment. A small group of ladies sang a feisty Gypsy chorus from Bizet’s Carmen, then the mood changed to a moving prayer by Rossini – ‘Moise’. Then it was tears of laughter, as three of the gentlemen donned wigs and sang a ‘special’ version of Nessun Dorma, set in an Indian takeaway where, needless to say, korma was on the menu. A rousing chorus from the Hebrew slaves took the audience to the interval. Tim Tarling opened the second half with a solo performance of A modern major-general, backed in the choruses by the choir, then a small group of ladies harmonised Offenbach’s Barcarolle. Laughter once again, as the gentlemen wore policemen’s helmets (couldn’t find any gendarmes ones!) and sang the Gendarmes’ duet, bobbing up and down as they ‘ran them in’. Another change of mood as the ladies sang Summertime from Porgy and Bess, then Sue Tansey sang Art is Calling me from The enchantress. Solos, duets and trios highlighted a medley of songs from The Phantom of the opera, before the finale by Queen – Bohemian rhapsody closed the show.